Students taking on self study will likely need a good pharmacy tech book. Even if you're doing an online program, you'll get lots of help from extra study materials. With many pharm tech certification training books on the market, and all with mixed reviews, I get 2-3 messages a week asking for suggestions on which ones are still good for the New PTCB Test™. Here are some books and study aids that I've personally reviewed and solidly recommend. These Flash Cards cover all of the exam subjects and will help you to hook the info into your memory. And, at about $3 for the App - it's a tremendous value. • Covers everything without much "Filler". • Well organized - easy to follow plan. • Hundreds of practice questions. • Includes a timed / online exam similar to PTCB. • Best value for the cost. 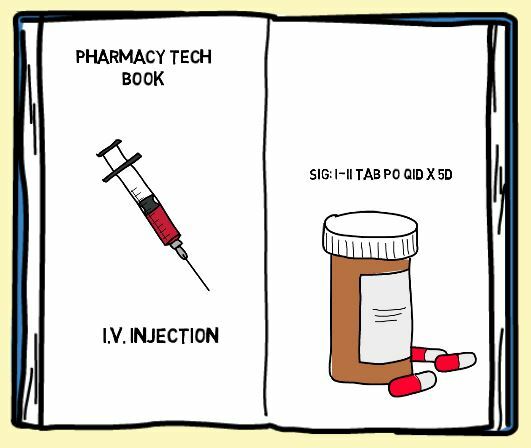 When this pharmacy tech book came out, I was shocked at how inexpensive it is. So, I ordered it just to have a look at it, and was pleasantly surprised. Well, I was impressed by everything except the Math. But, if Math is an area you're struggling with, then you should probably get second book devoted to Pharmacy Math. Anyhow, don't be put off by the low price, it's quite good.. And, unlike most of the other pharmacy tech books, this one gives you advice on how to make a study plan and what to expect, etc. In addition, you also get access to an online timed test, which resembles the official test's format. • Most up-to date for the New PTCB format. • Explains the certification process in detail. • Practice questions following each chapter. • Covers the topics covered in the newer exam. • Good value for the cost. • .99 cent Kindle/iPad version add-on with purchase. Written by a current pharmacy tech school teacher, this book is a fantastic study guide. If you're already good in math, then it may be all you need. If you also need help getting up to speed with math, he's also produced a great math book to accompany it that is available to buy as a workbook or as a free 644 page PDF download with purchase. If you've purchased the Pharmacy Technician Certification Exam Review book using the link above, Click HERE for the pdf download of the FREE math book. The only thing to be aware of with this pharmacy tech book is the smaller size, which will be convenient for some, but challenging for others. It measures 8.3 X 5.8 inches, which is similar to a desk thesaurus, and it won't stay open on a flat surface. All things considered, it's a great pharmacy tech book at a good value for what's included. Sean will probably even answer your emails if you have questions. Overall, this is my top content recommendation. 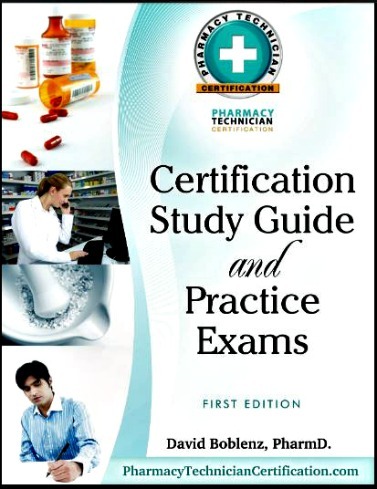 click here to READ MORE REVIEWS or order Pharmacy Technician Certification Exam Review from Amazon. • Pocket size, fits in lab coat or scrubs. • Great for memorizing Top 200 Drugs. • Includes Brand/Generic index lookup. 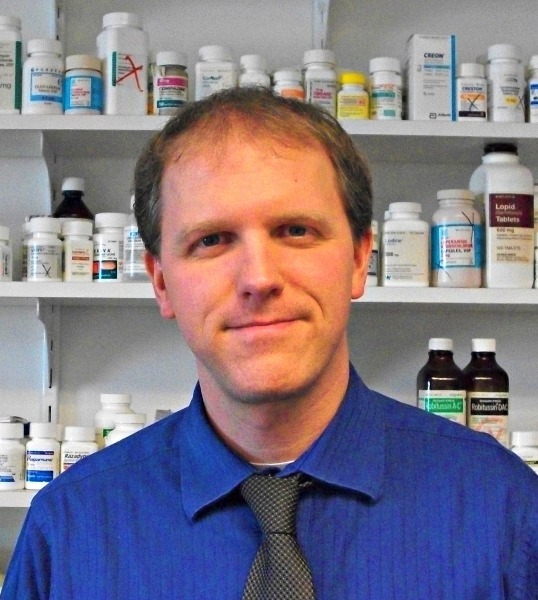 • DEA Schedule listed for C-II thru C-V.
• Includes common uses, side effect, M.O.A., etc.. This little book is positively a MUST HAVE for any Pharmacy Tech, whether as a student or working in the field. It's probably geared toward nurses and PharmD students, but it is also perfect for Pharmacy Techs. Don't be fooled by it's small size, the fonts inside are easy to read and scan to find what you need quick. It's jam-packed with info, and also includes prescription abbreviations, controlled drug classifications and more. Usually sells new for under 20 bucks !. click here to READ MORE REVIEWS or order The 2014 SCUT Monkey pocket drug manual from Amazon. • Great explanation of Ratio/proportion. • Easy to understand format. • Good IV Calculations primer. • Real world examples and shortcuts. If you've ever used a "for Dummies" book, you know that they get to the point in an easy to digest way (unlike the typical pharmacy tech book). What I also like about this one is that it focuses on what you'll probably see on the pharmacy tech exam. The index in back is laid out in a way that you can easily flip to the section you need when you hit a snag taking free practice tests. • Did I mention that it's FREE! This 142 page PDF/ebook which previously sold for about $30 as the same download that is now free. It's surprising to me that it's FREE, because it's as good or better than a majority of review books that sell for $50 - $100. If you have some copier paper and access to a printer, print this out! If you can swing printing it in color, I'd recommend it. And, if you have a 3-hole punch, binder and pack of dividers, that's even better. Click on the picture above or this sentence to download. • Export recordings as MP3 to play back on MP3 player. • Memorize conversions thru repetition. • Record lectures/notes in class. Voice recorders have come a long way, and many can now format MP3 files. When I was studying, I put together recordings of what drugs were in DEA Schedules, their common uses, classifications, brand to generic, etc. Philips is a good brand that I've had good luck with, and their products are a good balance of quality at a value price. However, If you have a smartphone, you may not need this. See the link below. *Important - Do you have an iPhone / Smartphone? - see HERE.